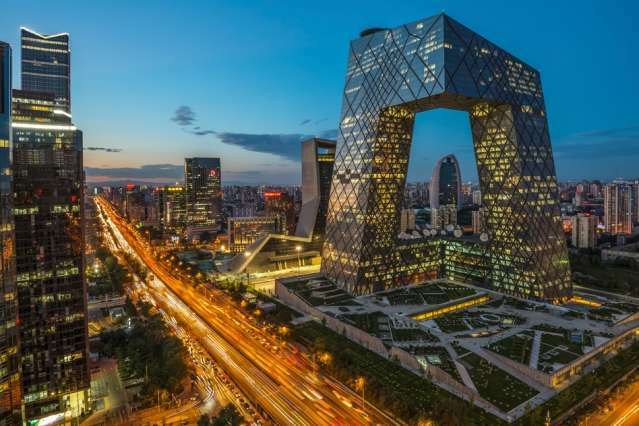 “Using carbon pricing in combination with energy price reforms and renewable energy support, China could reach significant levels of emissions reduction without undermining economic growth,” says Valerie Karplus. Pictured is a photo of Beijing. A new study co-authored by an MIT professor shows that China's new efforts to price carbon could lower the country's carbon dioxide emissions significantly without impeding economic development over the next three decades. Based on a unique model that links China's energy system and economy, the study finds that China's coal use, a major source of global carbon dioxide (CO2) emissions, should peak some time around the year 2020, while the country's overall CO2 emissions would peak around 2030, or perhaps sooner. Even so, the reduction in carbon-intensive economic activity would not prevent China from reaching its government's goal of being a "well-off society" by 2050. "Using carbon pricing in combination with energy price reforms and renewable energy support, China could reach significant levels of emissions reduction without undermining economic growth," says Valerie Karplus, an assistant professor at the MIT Sloan School of Management and a co-author of the new study. Details of the study appear in the paper "Carbon emissions in China? How far can new efforts bend the curve?" being published by the journal Energy Economics. In addition to Karplus, the other co-authors are Xiliang Zhang, Tianyu Qi, Da Zhang, and Jiankun He, all scholars at the Institute of Energy, Environment, and Economy, at Tsinghua University in Beijing. Da Zhang is now a postdoc at MIT. The impetus for the study comes from a headline-making set of recent policy shifts announced by China, including its toughest-ever set of regulations on local environmental pollution. In November 2013, China pledged to create more sustainable economic growth through a series of measures that included creating markets for CO2 emissions as well as other pollutants and scarce resources, such as water, more broadly. That set of measures also helped form the basis for an agreement to limit carbon use, which the U.S. and China announced in November 2014. Among other things, China committed to a goal of making nonfossil fuel sources account for 20 percent of its energy use by 2030; in 2015, that figure stood at 11 percent. The U.S. pledged to reduce its total CO2 emissions about 26-28 percent by 2025, in comparison to 2005 levels. In turn, that bilateral agreement has been widely credited with paving the way for the larger set of carbon-reduction pledges agreed to globally at the U.N. Climate Change Conference held in Paris in late 2015. The study uses a model of China's economy and energy output, called C-GEM, developed by scholars at the Tsinghua-MIT China Energy and Climate Project. Karplus served as director of that project from 2011-2015. She joined the Sloan faculty in the fall of 2014 as the Class of 1943 Career Development Professor. She is also a faculty affiliate of the MIT Joint Program on the Science and Policy of Global Change and the MIT Energy Initiative. The model compares and contrasts two main paths that China's energy consumption could take: One, which the paper calls the "Continued Effort" scenario, is a business-as-usual trajectory. The other, based on China's announced reforms and environmental initiatives, is called the "Accelerated Effort" scenario. In the "Continued Effort" scenario, China's carbon emissions would not level off until around 2040, ten years later than in the "Accelerated Effort" scenario, and at a level 20 percent higher. The model outlines some additional broad contours of China's energy future given the more stringent set of policies. Coal would drop sharply as a source of primary energy, or raw fuel, from around 70 percent in 2010 to around 28 percent in 2050. "Coal today is used with varying degrees of efficiency across the Chinese energy system," Karplus observes. "The model is capturing the fact that you have a lot of low-cost opportunities to reduce coal, from heavy-industry direct use as well as the electric power sector, from facilities using less energy-efficient technology or processes." In all scenarios, the model also simulates that over time, China's famously high savings rate will decline, as has been observed in many developing economies. As a result, more of China's GDP will be composed of consumer-driven spending, not state-led investment, which itself will drive reductions in carbon emissions per unit of GDP. "The consumption share of GDP has a very different carbon intensity, as a bundle of goods, relative to investment goods, so you automatically get a reduction in carbon intensity from that trajectory," Karplus says. Think of it this way: At the moment, a larger portion of household earnings in China are tucked away in banks, where they are loaned out and used to fund massive infrastructure projects—highways, dams, power plants—which release huge amounts of CO2. In the future, if China's households save less, more of the country's money will be spent on services and everyday goods, which have a smaller aggregate carbon footprint. The MIT-Tsinghua study's findings have gained the attention of many policymakers in the energy sphere and have been regarded as an important estimate of China's potential energy and CO2 emissions trajectories. John P. Weyant, a professor of management science and engineering, director of the Energy Modeling Forum, and deputy director of the Precourt Institute for Energy Efficiency at Stanford University, calls the model "state of the art" and says it "produces policy-relevant insights regarding the implications of the two policy scenarios" in China. He adds that the model contains a "realistic representation of the pathways by which the Chinese and world economy can be expected to adjust to these policy initiatives." Karplus readily acknowledges that with any energy and economic modeling of this scale, many uncertainties remain. Still, she thinks it is clear enough that the "Accelerated Effort" scenario for China would produce a significant reduction in China's emissions. "You can have some confidence in the relative numbers despite the huge uncertainties, if you look at the two cases," Karplus asserts. "The value in this exercise is in its ability to look at alternative levels of policy effort and the relative impacts those would have."